St. Petersburg, New Year's Eve, 1916. Marina Makarova is a young woman of privilege who aches to break free of the constraints of her genteel life, a life about to be violently upended by the vast forces of history. Swept up on these tides, Marina will join the marches for workers' rights, fall in love with a radical young poet, and betray everything she holds dear, before being betrayed in turn. As her country goes through almost unimaginable upheaval, Marina's own coming-of-age unfolds, marked by deep passion and devastating loss, and the private heroism of an ordinary woman living through extraordinary times. This is the epic, mesmerizing story of one indomitable woman's journey through some of the most dramatic events of the last century. Janet Fitch's first novel, White Oleander, a #1 bestseller and Oprah's Book Club selection, has been translated into 24 languages and was made into a feature film. Her most recent novel, Paint It Black, hit bestseller lists across the country and has also been made into a film. She lives in Los Angeles. 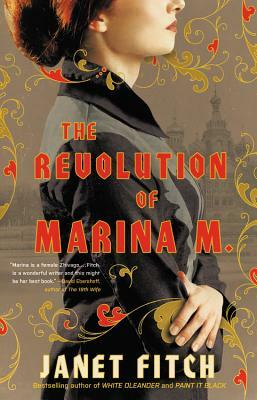 living in St. Petersburg at the start of the Russian Revolution in 1916.
rights-and finds herself falling in love with the movement and a young radical. rising up the oppressed, naïve hope, abrupt reversals and crushing betrayals.